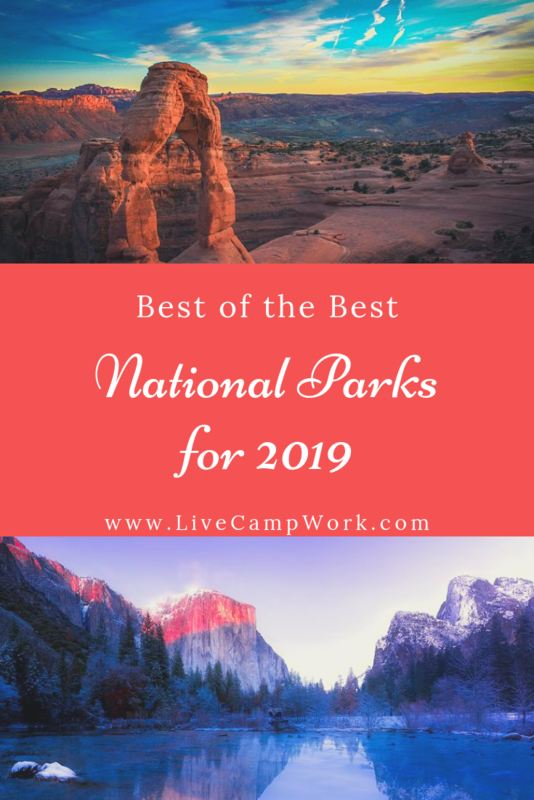 Which National Parks Should You Camp at in 2019? Glacier National Park consists of more than one million acres. It includes three mountain ranges and more than 130 lakes. Its beauty and size has deemed it the “Crown of the Continent.” Glacier National Park was the first International Peace Park in 1932 along with Canada’s Waterton Lakes National Park. It has an enormous wildlife population which has survived the years. Additionally, it has one of the purest and longstanding wildlife populations, maintaining nearly the full animal species since European inhabitants. Only two animals have migrated out of this area. It is also famous for its Triple Divide Peak which supplies water to three different oceans- the Pacific, Atlantic, and Arctic Oceans. No other peak in the world does this. This park has welcomed over one hundred million guests since its inception. When you visit Glacier National Park, you can look forward to seeing their official mascot, the Mountain Goat. There are a number of activities of course, hiking, climbing, water activities, tours, etc. Lastly, there are multiple options for tours like wooden boat tours and the historic Red Jammer buses that have been restored. The park offers thirteen campgrounds with over 1,000 campsites to choose from. Over three hundred million years ago, a sea covered what is now Arches National Park. The sea evaporated and reformed twenty-nine times. Additional weathering and erosion formed what is now Arches National Park. This park is well known for the 2,000 natural arches it has. The biggest, the Delicate Arch, spans sixty feet tall. This Arch is famous in Utah. It has been branded on license plates and stamps due to its popularity. The Olympic torch relay in 2002 was through this arch. The true rareness includes the astronomical beauty as well. The dark night skies are beautiful and you can see stars for days. Vegetation is a huge part of the ecosystem in Arches National Park. You can find over 400 types of plants here. This park has a little of everything, auto touring, backpacking, biking, hiking. While the park only has one campground, Devils Garden, it is open year round and gives you the best chance at the night views. The most popular seasons are April-May and September-October. Located west of Seattle, Washington, Olympic National Park posesses one of our nation’s most irreplaceable landscape assortment. Miles and miles of coastline, glacier covered mountain peaks, old growth forests, and one of the only temperate rainforests in the entire world makes Olympic National Park one of, if not the most, amazing wonders of the world. They are well known for their cat-like rodents, Marmots. These mammals can be seen and heard all over this park, whistling to communicate. While many National Parks are great options to visit during the Spring and Summer, Olympic National Park is also a fantastic place to visit in the Winter. Hurricane Ridge is a great spot for skiing and snowboarding! There is a lot of history in this National Park. You can find petroglyphs from the Makah Tribe on the Ozette Triangle Trail. You can visit the Elwha River and learn about the largest dam removal project in our history. Aside from the history, there is hiking, backpacking, boating, fishing, exploring tide pools, etc. Campgrounds are opened year round but majority of their camping traffic comes between June and September due to the rainy season other wise. Love this content? 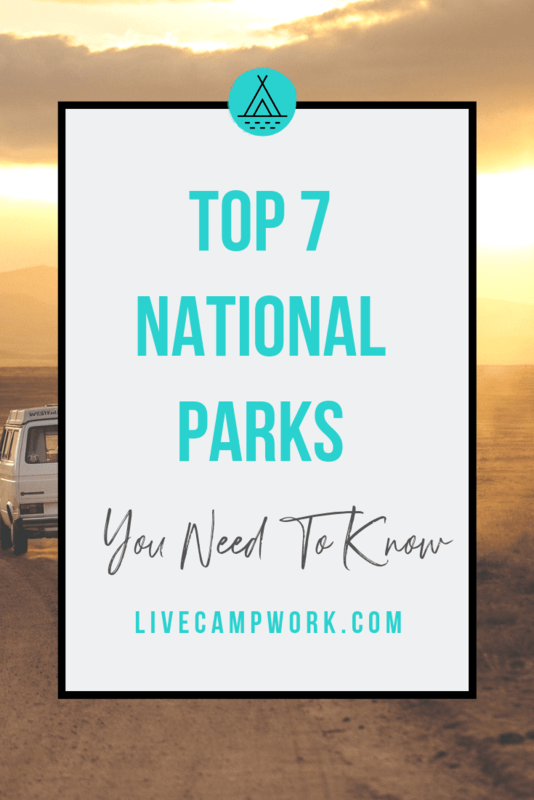 Grab the printable to go with it and get the information you need on FREE entry dates for national Parks in 2019! Rocky Mountain National Park is big for everything. This park boasts one of the largest wildlife populations in the United States. In 2009, Congress deemed over 250,000 acres of the park as protected wilderness. You can find over seventy mammal species and about three hundred types of birds. It also has the highest and biggest continuously paved highway, Trail Ridge Road. This highway crests up to about 12,000 feet high. It is rumored that you can climb over 5,000 feet in less than four minutes. There is a huge museum collection with roughly 30,000 cultural objects, three hundred works of art, 11,000 biological specimens, and five hundred geological specimens. They even do camping big! There are five campgrounds with over five hundred campsites. IF all of that isn’t enough, you can enjoy hiking, fishing, horseback riding, and even cross-country skiing and sledding in the winter time! Grand Teton National Park is where you can find one of the youngest mountain ranges in the Rocky Mountains. Due to its young age, there is little to no erosion, giving this park one of the most amazing landscapes you could imagine. In 1950, Jackson Hole was officially added to this National Park with the help of John D. Rockefeller, Jr. Jackson Hole required an airport for tourism, making the Grand Teton National Park the only one to have a commercial airport within the park. Jackson Hole’s popularity makes this park a little different than most. There’s much more tourist areas like shops and restaurants close to campgrounds. But there is still history and wildlife to bask in. Here you can find rocks that date back over two million years ago. You can also find the western hemisphere’s fastest land mammal, the Pronghorn. This mammal can run over seventy miles per hour. This park is great year round with camping, hiking, boating, fishing, mountaineering, rafting, snowshoeing, biking, and even skiing. Yosemite National Park is a huge park in our nation’s history. While it is our third National Park, Yosemite Valley was the basis for the idea of National Parks. On June 30, 1864, the Yosemite Land Grant was passed and this was the first time the Government protected land due to its natural beauty. This park is one of the most beautiful we have, especially at night. In mid to late February, at sunset, the granite rocks glow like fire. It is gorgeous. Additionally, in Spring and early Summer, you can see lunar rainbows, or moon bows. Yosemite is actually world renowned for their rock climbing because of the ample amount of space and opportunity to climb! They also have a large wildlife population that you can catch glimpses of with over four hundred species on park grounds. The park has multiple campgrounds, but one is specifically for RV’s- Indian Flat RV Campground. While the park is open year round, seventy-five percent of visitation happens between May and October and majority of the population stays right in Yosemite National Park. But if you are not a crowd person, try another time of the year for peace and quiet! Zion National Park was originally Mukuntuweap National Monument in 1909. By 1919, it was deemed a National Park. When the park was new, it was in horrible condition for tourist traveling. In 1930, the Zion-Mt. Carmel Highway and Tunnel was built. It is a 1.1-mile-long road used to explore the Zion National Park. It has a number of unique attractions like the Weeping Rock. This rock looks like it is always crying from the water oozing from it. It took almost 1,000 years for the water to travel through it. Angel’s Landing is deemed one of the most dangerous hikes in the world, but if you can do it, you are rewarded with Zion’s gorgeous scenery. It also has a Subway. It’s not an actual subway, and can’t be used as public transportation. Tourists need a permit to explore through Zion’s Subway, but the things you will see are life changing! Zion National Park also is the home of the California Condor, one of the most endangered bird species. Zion only has three campgrounds, but it has been one of the top ten national parks for camping.